Road Angel Navigator 7000 is the only Navigation system you need for all your journeys - 2 Products in 1, Satellite Navigation with RoadAngel safety alerts, or the Unique Road Angel only mode. Advisory Speed limit at hazards with unique colour coded screens. Road Angel Navigator 7000 has been discontinued. Road Angel Navigator 7000 guides you straight to your destination using comprehensive and up-to-date street-level mapping of the UK, an easy-to- use touch screen and full postcode searching and guards you for a trouble-free journey with an award-winning database of accident blackspots, safety cameras and other hazards. The Road Angel Navigator 7000 also includes automatic route re-calculation. The European Camera and Accident Blackspots are available as an optional extra. Road Angel Group Ltd has logged the locations of every speed camera across Western Europe with the same care and attention as in the UK. This European database is now uniquely available as an upgrade to owners of Road Angel Navigator 7000. The Road Angel Navigator 7000 is easy to install using the provided suction cup and operates independently using power from its internal rechargeable battery for up to 8 hours. You can also power the Road Angel Navigator 7000 directly from the cigarette lighter socket. 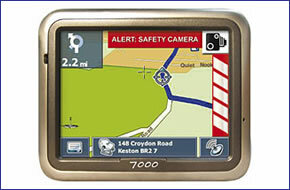 Easily update your Road Angel Navigator 7000 with the supplied software. The first six months of updates are free of charge. Subsequent subscription charge of £3.99 per month by Direct Debit and a minimum 12 month contract is required.